What a blessing to have a local business contribute $500 recently for the Saints’ Pantry Backpack Program. Shelton School District has identified 387 students who are either homeless or extremely low income. With this contribution, 21 students will receive 60 child sized meals of nutritious non-perishable protein that tastes great and feeds the body with quality nutrients,vitamins, minerals, protein and fiber so critical for healthy body growth and brain development. The need has never been greater with a reduction in food stamp allotments, nationwide drought & a significant decrease in food pantry donations by faithful food contributors. Here’s how you can help. 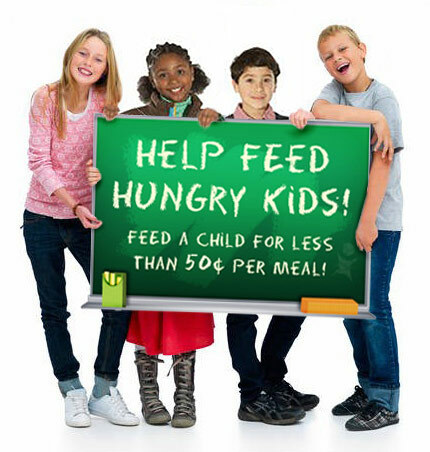 Simply donate $24 per one non-perishable protein pouch (feeds 60 child sized meals). Your $24 goes farther with the Community Challenge…as the regular price per pouch is $49. Your $24 gets matched and is shipped out on your behalf directly to the Saints’ Pantry at no cost to the food pantry and with free shipping. These bags are given to the Shelton School District Liaison to these at-risk kids. Imagine making the difference in the lives of children in our own community. Our goal is reaching every one of the 387 students! The Shelton Challenge encourages everyone, young to old, to participate in this year’s Goldsborough Creek’s Run ♦ Walk ♦ Jog this coming Saturday, June 2, 2012. 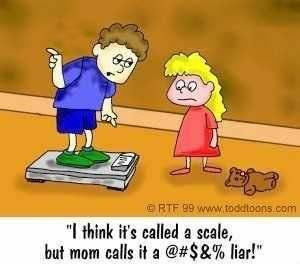 Geared to meet everyone’s fitness level. A great way for the entire family to participate. Goldsborough Creek Run course begins on the Shelton Valley Loop Road. The 7-mile stretch takes the loop around the valley, with the 2-mile start line leaving the valley and progressing down Railroad Avenue. All participants will have completed their race on Railroad Avenue prior to the start of the Mason County Forest Festival Paul Bunyan Parade. A fabulous way to get out and MOVE while supporting the Mason General Hospital Foundation. Can’t Wait to See Y’All @ the Finish Line! Wow! What a beautiful morning for this 7 mile walk. Started @ 7 am in the Shelton Valley with just a light drizzle or rain…lasted just a few minutes. So many of our prayers were answered!! The countryside was amazing as it seemed to stretch out forever with curious cows wondering what is this herd of people doing?!?!? The fellow walkers were a joy to participate with….actually the most fun was getting to know one another as we waited for everyone to finish for the coveted “Raffle!” The crowd was packed with women who work @ Mason General Hospital. Loved seeing these ladies helping to support their employer and put fitness and health as a priority. 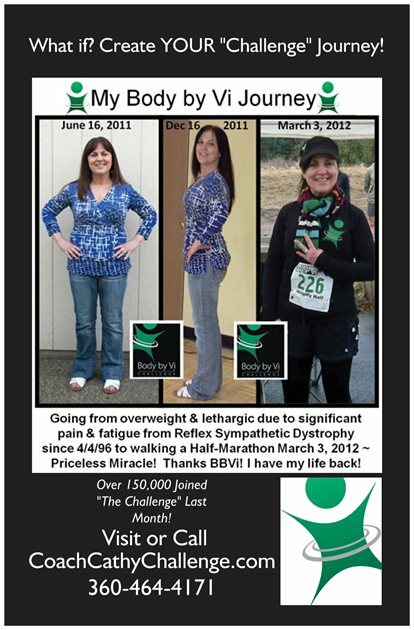 I am in awe to think about my past year’s journey with the Body by Vi Challenge that literally took me from being overweight, tired…very little energy, as well as pain & fatigue from the past 16 years due to Reflex Sympathetic Dystrophy…a disease I sustained from a volleyball injury. Took me from being an active parent, soccer player, school nurse, volleyball & soccer coach to minimal activity…only able to continue volleyball coaching, Praise the Lord! Yes, Victim to Victorious!!! 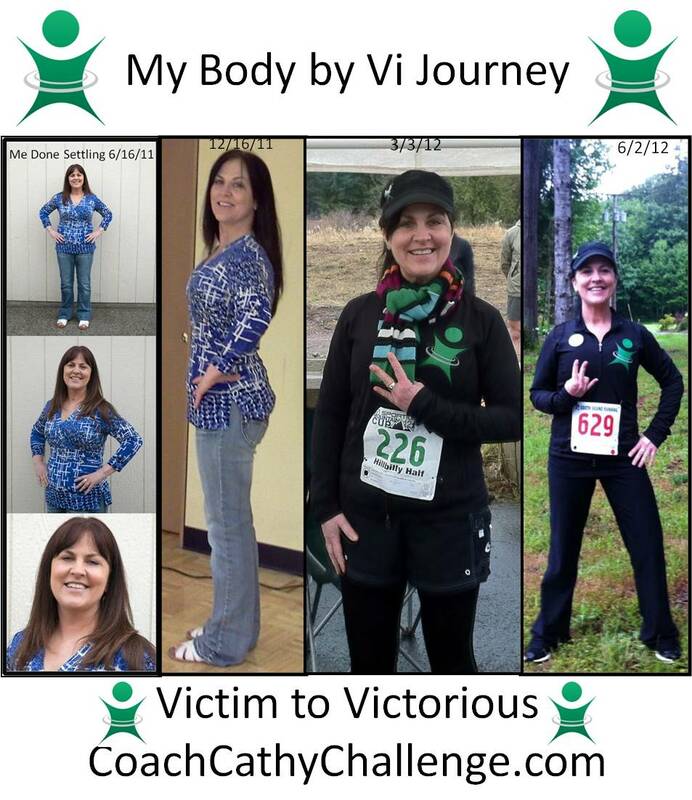 To learn more about the Body by Vi Journey, visit http://CoachCathyChallenge.com It could be the answer to your prayers, like me; or someone you might know. Feel free to share this information and website with others you know and love. Goldsborough Creek 7 Mile Walk June 2, 2012 Victim to Victorious! Scroll Down for Ways to Get Registered…..Can’t Wait to See Y’All @ the Finish Line! On-line registration powered by Active.com. Requires use of credit card; a processing fee will also apply. Click here. Print the form below and mail with fee. A reduced Early Registration fee of $20 applies if registering before May 14, 2011. All orders for optional shirt must be completed by May 14, 2011.
Who is The Shelton Challenge for? The extremely obese to elite athletes…listen to their stories. The Shelton Challenge, powered by the Body by Vi 90 Day Challenge, has the ability to not only help those who have significant weight & health issues, but also seasonal to elite athletes. The Challenge is a platform to help us be more aware of the foods we are putting into our body so we can make better decisions on avoiding the foods that damage our bodies. Getting out a moving, simply 15-30 minutes a day can be a tremendous beginning for some while others will focus on raising their level of current activity. Enjoy hearing from Courtney Cummings & Eric Rose. 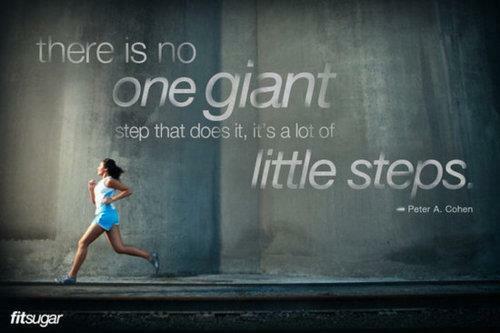 May it inspire you to take on The Challenge. 13 Year Old Gymnast Loves Body by Vi Shakes!